Elevation Change: Climb 1540' before descending back to the trail head. 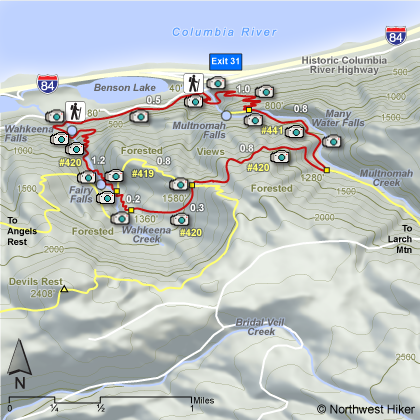 This hike can be done clockwise or counterclockwise. This description will be clockwise. The paved trail takes the hiker across the bridge between the lower and upper Multnomah Falls, then continues steeply through mostly wooded areas with occasional views and many switchbacks to the top of the ridge. The trail continues downhill for a short distance then after the turnoff to the view point at the top of Multnomah Falls, the trail becomes unpaved. There is a large stone bridge across Multnomah Creek, then the trail begins to climb again but not as steep. After crossing the bridge there is a junction to the right to the Perdition Trail which has been closed for several years due to unsafe conditions. Continue up Trail #441 pass many outstanding waterfalls for about .8 miles and turn right at the junction to Trail #420. This trail continues uphill for another .8 miles then intersects an optional way down to Wahkeena Falls by Trail #419. Or one can continue on Trail #420 which takes the hiker past the trail to Angel's Rest and continues downhill past Fairy Falls to Wahkeena Falls. There is a short half mile hike back to Multnomah Falls that parallels the Old Columbia River Highway. 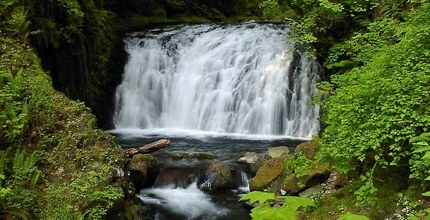 Dutchman Falls on Multnomah Creek as seen from the loop trail. Alternatively, take I-84 east to Exit #28/Bridal Veil and drive east on the Historic Columbia River Highway to the Multnomah Falls Lodge parking area. Coming from the east on I-84, take exit 35 (Ainsworth Park) and drive about 4 miles west on the Historic Highway to reach the Multnomah Falls Lodge parking area and trailhead. From Portland, due to overcrowding at Multnomah Falls in peak season, we highly recommend for convenience and safety, that you consider using the Gorge Transit bus . The price is low and the convenience is high.